The Leadership Fayetteville program, currently holding Class XXXII, has a mission to produce a continuous stream of concerned, motivated, and educated individuals of diverse talents and interests eager to pursue and assume leadership roles and volunteer opportunities within the Fayetteville community. This ten-month program meets once a month from August through May and gives participants the opportunity to explore Fayetteville as they develop and enhance their leadership skills. 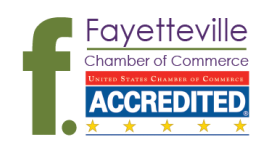 Any member of the Fayetteville Chamber of Commerce is eligible to apply for the Leadership Program. A formal application must be completed and returned to the Fayetteville Chamber.